I had fallen in love with a Rajasthani girl once; now I have fallen for all that is Rajasthani. Don't know whats with me and Rajasthan. Probably I was the court jester in some Mewar court in my previous life, who got beheaded for calling the queen a fatso. Whatever be the reason, I cannot help talking about the place after I returned from a 10 days trip there. A land where the people are equally interesting and colorful as the costumes they wear; a land that hides its lushness behind the Aravalli ranges, carefully camouflaged with the arid deserts. There is much to say about this land, where the past still lives on in the company of the present, and I'd rather do this by introducing some wonderful people we met. Kannan and myself; we reached Jaipur that Friday night with a return ticket and an open mind. Sanganeer airport, which is about 14 kilometers south of Jaipur, looked too quiet for an airport and we were more than happy to land into nothingness than a crowd. Unable to find even a tea shop in the vicinity we soon left for Jaipur. We had to pick up Sowmy from the station who was coming from Chennai via Delhi. We found a small hotel very close to the station and that is where we met Shailesh. From the first moment he reminded me of school masters; not sure whether it was his indifferent but piercing eyes or the insistent nature. He was managing the small motel for his master and for him checking-in was equivalent to letting him make decisions for you for the next few days. He told us what to eat for dinner, where to go the next day and so on in the first 10 minutes itself. We were indeed happy to accept his suggestion regarding dinner as there was no eatery open at that time of the night, and soon we were treated to hot chapathis and daal. The next morning we had plans to elude Shailesh and go ahead with our exploration of Jaipur, but a bigger hurdle was waiting for us at the reception in the form of Rajesh Jain, the owner of the hotel. If Shailesh was a bully Rajesh was a steamroller. He didn't waste any time in telling us about his acquaintances across the country. He even called one Javed bhai from Bangalore on his mobile and gave the phone to me without any introduction and said 'talk'! Having learned from the movies that it is offensive to not treat a 'bhai' with respect, I spoke to him. Looks like he was equally surprised at the sudden move from Rajesh. We exchanged our whereabouts in Bangalore and quickly ended the conversation. Though Rajesh was a bit of a show-off initially, his connections did help us a lot in the coming days.. more about that later. Hearing about our itinerary for the day Shailesh quickly arranged a cab and a driver for us and thus we met the next character - Bheem! Unlike his name, Bheem was a lean and courteous guy. Soon we started the Jaipur tour under his guidance. We first visited the Albert Hall Museum, a treasure trove of art and crafts, jewellery, sculptures and paintings. There is a huge collection of Egyptian and Indian murals & paintings there, not to mention the collection of musical instruments and weaponry. You can spend half a day in the museum without getting bored. Our next stop was the Rajasthan Tourism Department's warehouse, supposedly the best place to shop for Rajasthani textiles and craft. Folks there will explain the process of dyeing and block printing if you are interested in knowing the process behind those beautiful garments and designs. The price you pay for this education is the Pashmini shalls and kota saris you might end up buying from there; not a bad investment I say! Our next destination Amer Fort, is some 10 kilometers from Jaipur and is a majestic four-level construction atop one of the hills of the Aravalli ranges. It overlooks the Maota lake on one side and Jaipur city on the other. 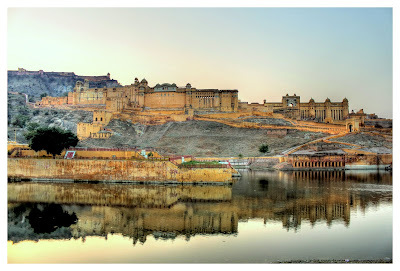 Right above Amer fort, on another hill is the Jaigarh fort and you can walk up to it from Amer. There are dozens of Gray Langurs all around the place who keeps you company and at times entertain you with their antics. Every wall and ceiling at Amer fort is embellished with mosaics and sculptures. On our way back we stopped by Jal Mahal, a palace built in the middle of the Man Sagar lake. 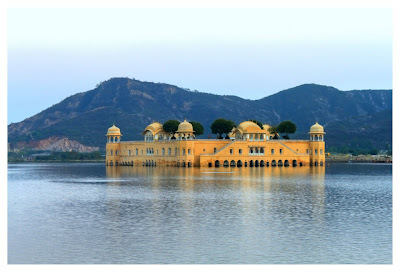 It was surprising to know that such a beautiful palace was constructed with great effort in the center of a beautiful lake, for nothing but duck hunting! Weird are the ways of the royalty. On the way back to the city we stopped at the garment factory ran by the Maharani of Jaipur. The jewellery store there had a palmist who had a pretty neat trick to persuade you into buying some semi-precious stones. This guy will give you a lecture initially, on the cost of precious stones and how difficult it is for someone to purchase a piece of their birthstone. But then he has a solution to the problem - alternate birthstones! These are semi-precious alternatives for your original birthstones. And to identify your stone, there is another trick. The guy puts a few drops of water onto your palm, and mixes a special paste -made in Rishikesh by a great sage- in it. This is done when you are holding a stone in your other hand. When this is done if the color of the water changes to pink, then the stone you are holding is your alternate birth stone. If it doesn't work the first time, you change the stone and try again. I tried with a few stones and finally with yellow topaz the water turned pink! This entire show is pepped up with generous servings of palm reading. He looked at my palm and said I have a loose character. Somehow he got the idea that I am married and advised me to stick to my wife and not to wander around looking for other women! These guys generally have a good sense of humor and you can't help but laugh at even the most outrageous comments they make about you :) In Rajasthan you see palmists, magicians and traditional musicians in every street corner, not to mention the forts and other tourist destinations. We somehow escaped the factory without buying anything but the palmist's advice. Our last destination for the day was Chokhi Dhani, a Rajasthani village themed resort, some 20 kilometers outside the city. The highlight of the place is the Rajasthani food they serve. The friendly waiters serve you till you fall, with all kinds of sweets and other delicacies made in pure ghee. There are many stages and amphitheaters there, where traditional Rajasthani arts and dance forms are presented all evening. This is a place better suited for those who want to get a feel of Rajasthani culture and cuisine in a few hour's time, without traveling across the state. By the time we got out of the place the only thing we wanted was a bed to sleep, such was the power of the food! We got back at the hotel by midnight and with much effort evaded the numerous questions Shailesh had on the day's experience. With another long day ahead, we slept off in no time.